I was watching Netflix on my couch when I heard a loud bang coming from the closet in the dining area. I quickly turned to see what it was and didn’t see anything amiss. 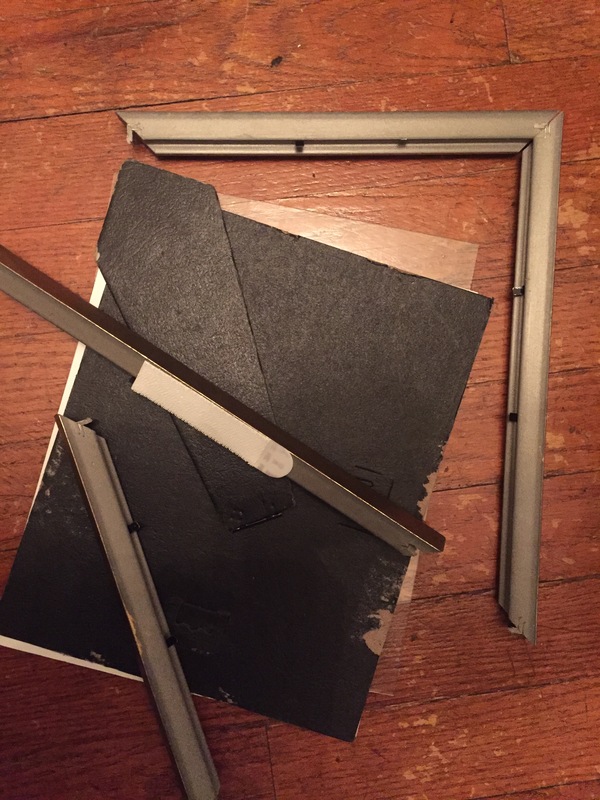 Awhile later (it’s Netflix), I went to the kitchen, and noticed one of the frames on my frame wall had fallen. 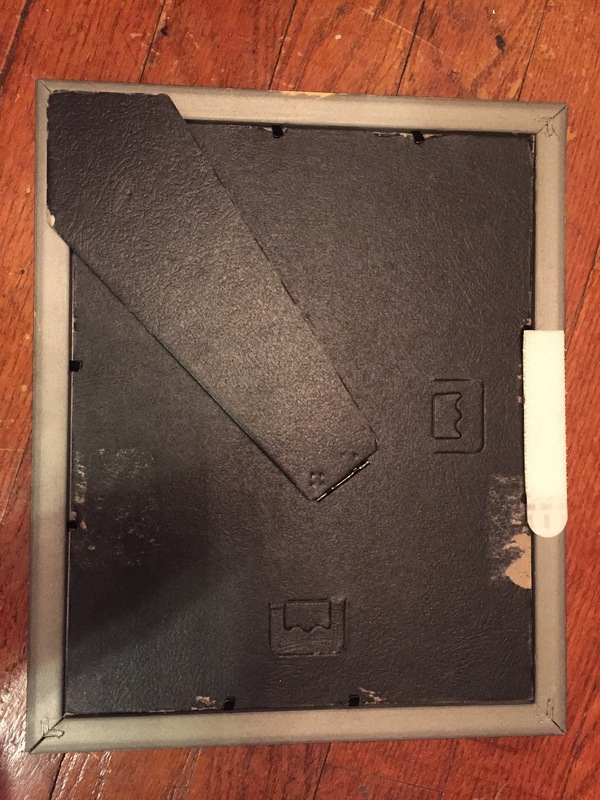 It was broken, but I was able to put it together with some Shoe Goo glue. Now the picture of my old neighborhood is once again hanging proudly. Unfortunately, this is not the first or second or third thing to fall off my wall…hopefully my apartment isn’t cursed! Oh, another infrequent post on this blog! Yeah…most of the kitchen stuff is still chasing the contractor down for updated project scopes and estimates, and then forwarding that on to the property manager for their approval and the approval of the board. But that didn’t stop me from taking another step towards a nicer kitchen! Unsurprisingly, I’ve been browsing appliances for quite a few months (or years). I’ve been very picky about the range, the microwave, and the dishwasher–so much so, that there’s basically just one or two that fit all my requirements. But the only requirement I had for the fridge was that it be taller than me, and at five-two, that’s not a tall hurdle (pun intended). 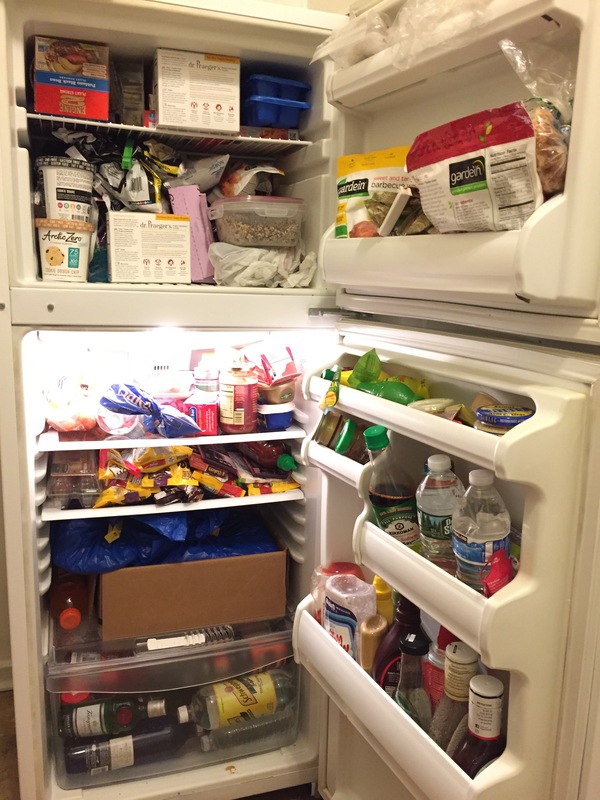 Most of the newer refrigerators are six feet, which meant I had a lot of options, and I don’t do well with options. 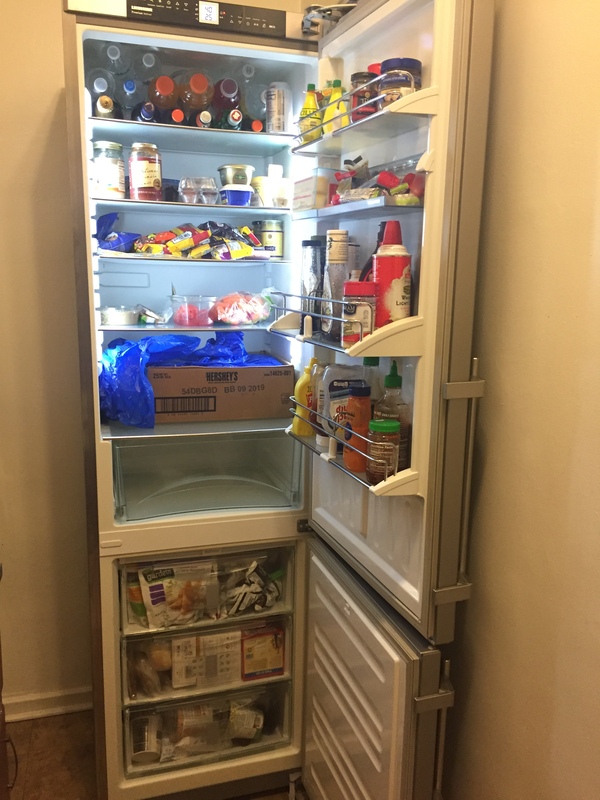 Then the choice got easy: this past week, the Habitat for Humanity NYC Restore posted a very nice fridge. Not only that, but they were also having a sale! 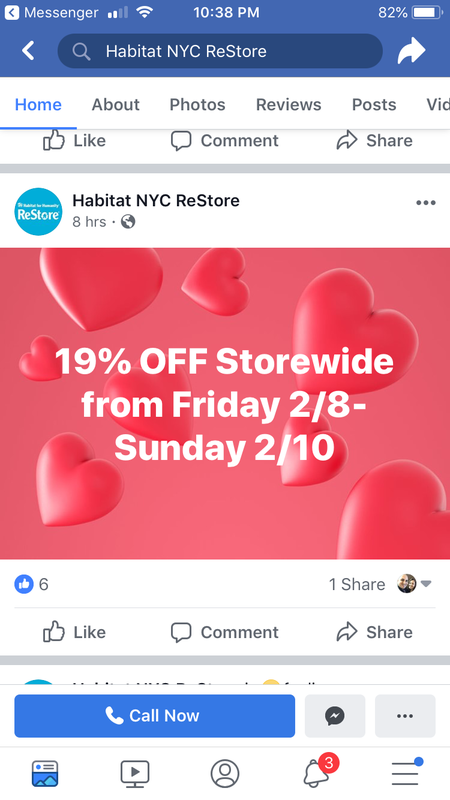 I went to the Restore in Queens on Saturday to check it out. 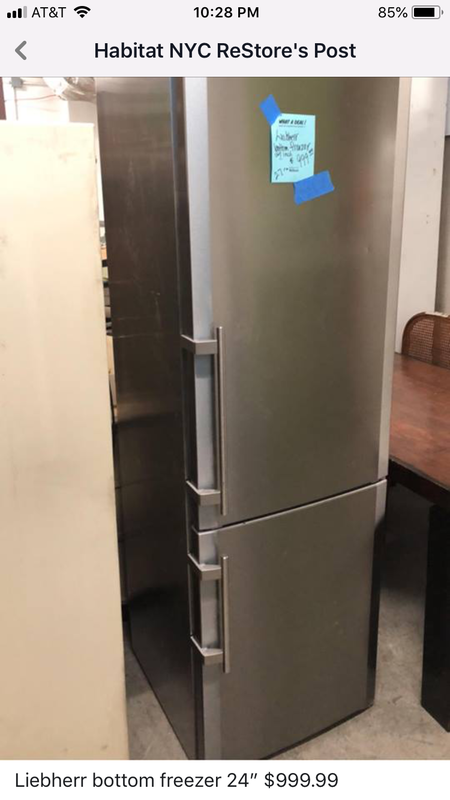 It worked, it was in great shape (just a few small dents on the front), and I would never be able to have a fridge this nice otherwise–they retail for over two grand! 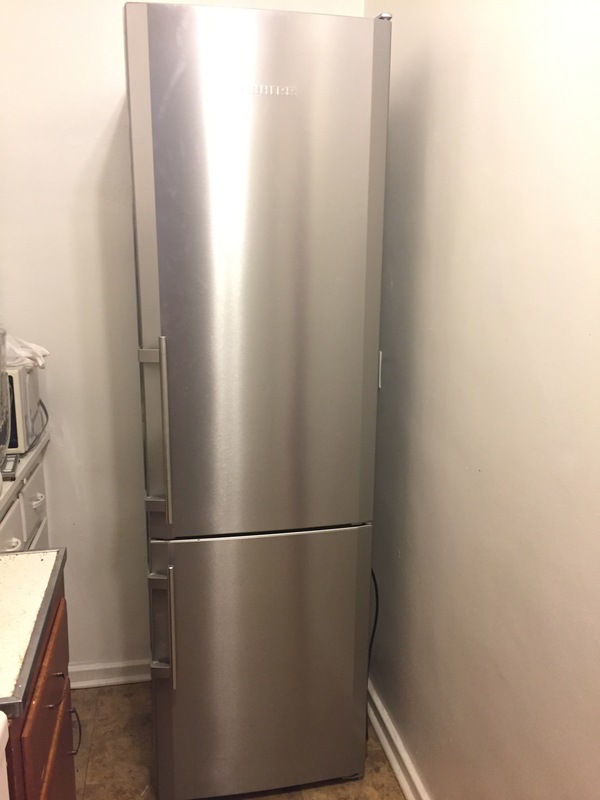 As for the height, it’s almost eighty inches 🙂 All of the other (new) fridges in my price range were only six feet. I scheduled delivery for Tuesday, and then I had to get to work! First, was clearing out my kitchen to make room for the fridge swap. 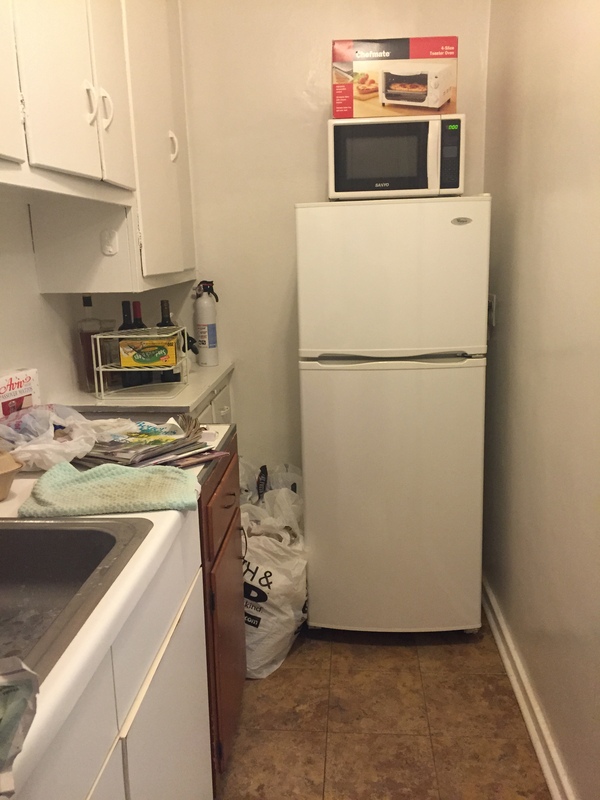 I also had to find a new spot for the microwave, since I won’t be able to reach the top of my new fridge (the current fridge is a measly five feet–yes, I’m taller than it, hence my requirement). 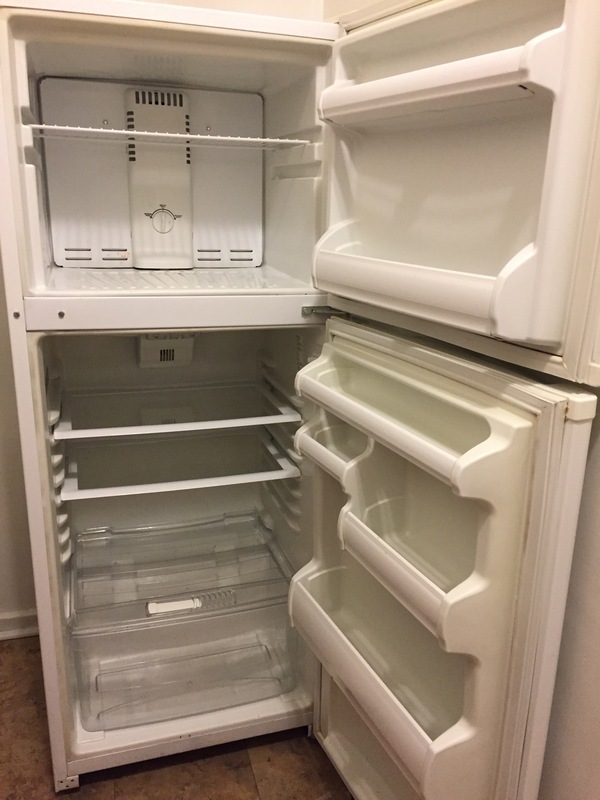 Tuesday came, and I had to empty and clean the fridge, as I was donating it to the Restore. Luckily, they don’t need an even swap. Yeah, I stuffed the fridge, and I have two shelves with chocolate. 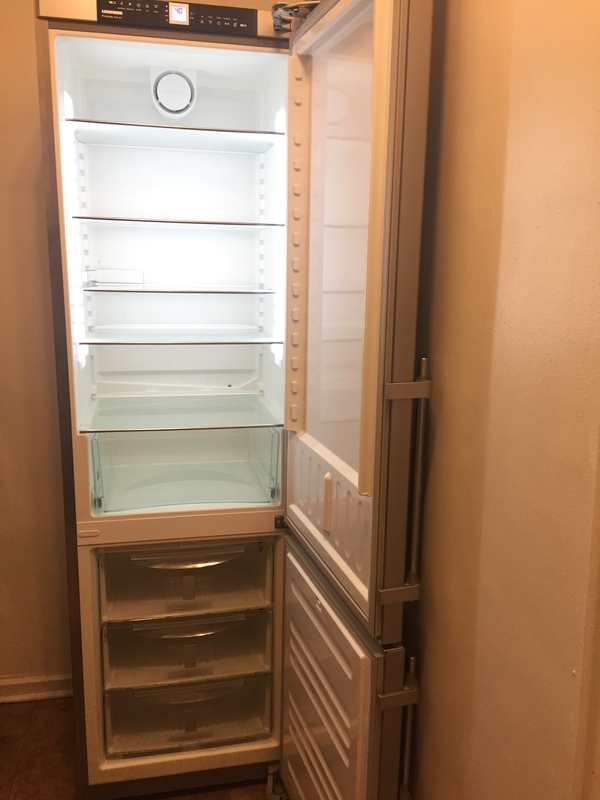 The delivery guys came and left in a jiffy, and then I had a shiny new-to-me fridge! It’s so pretty and tall! It took awhile to clean all the shelves, and then find a shelf configuration I liked. 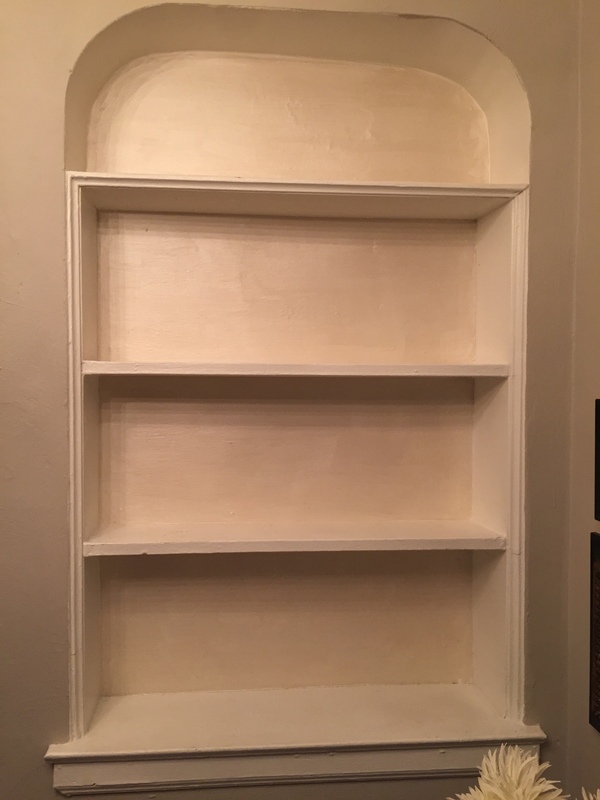 There are FOUR adjustable shelves and FOUR adjustable door shelves–so many options! Where my old fridge and freezer were packed, there’s plenty of room to spare in this one! It’s a little stretch to reach the top shelf and control panel, but the kitchen design called for a filler piece between a six-foot tall fridge and the cabinet above, which is now unnecessary since this guy is so tall. It’s nice to finally have something new in this kitchen! I can’t wait until the rest of the kitchen is finished. In the mean time, you can find me opening and closing the doors (which are soft close like fancy cabinetry), and staring at it in all its tall and shiny glory. I’m sure you’ve noticed I haven’t been writing. Yes, I’m still alive. Yes, I’ve done a few projects. Yes, I can catch you up! First, some sad news. 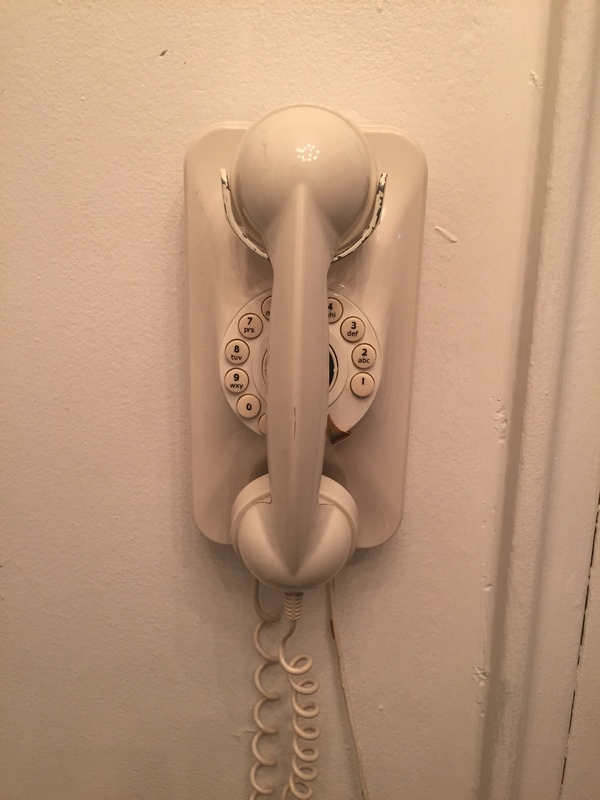 Remember the phone I worked so hard to connect to the building’s intercom? Well, it doesn’t work anymore. Not because of me, but because the building joined the 21st century, and got a new intercom that calls your cellphone! It even has a Bluetooth option, so you can unlock the door with your phone! Now, some exciting news: I’m a trend setter! 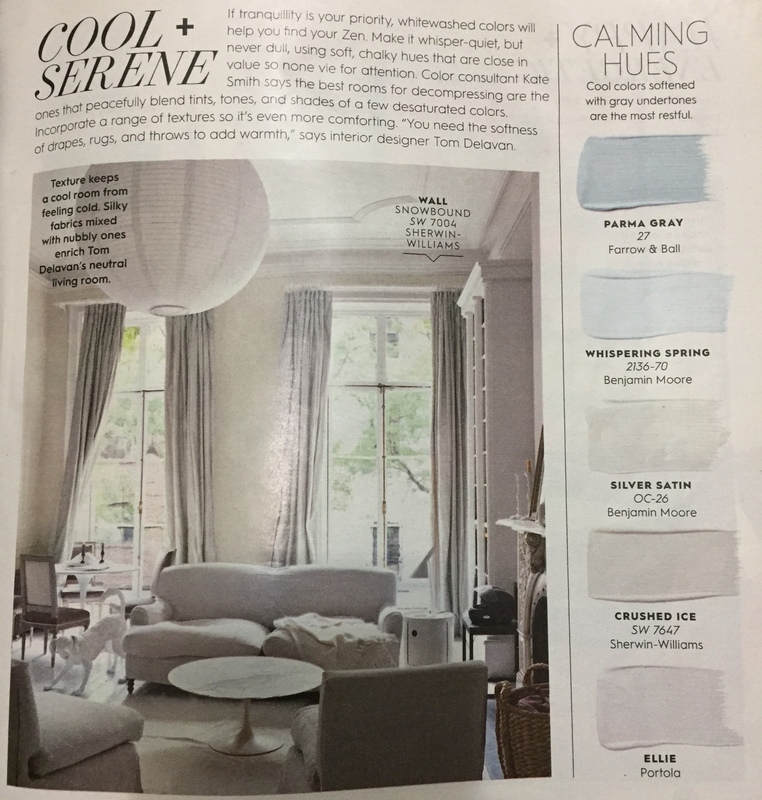 Better Homes and Gardens did a piece in their April 2018 issue on using color to influence the feeling of your home, and one of their “Calming Hues” is the same color I used to paint the living room: Silver Satin! In other news, I’m still hoping to get my kitchen renovated this year, and I submitted my proposal to the co-op last week. Fingers crossed they approve it quickly, and I can get that ball rolling! 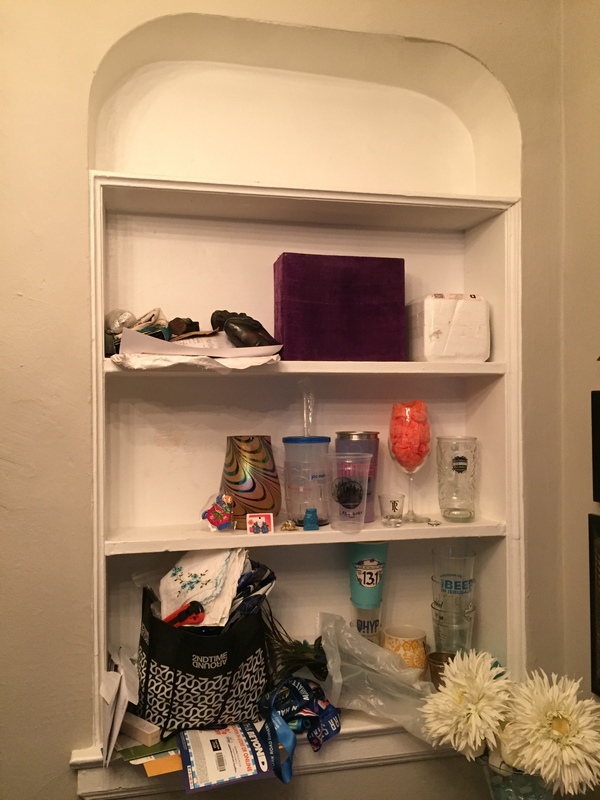 There’s a built-in shelf in the dining area, which became a random holding spot when I was moving in. It became a little less random as I settled in, but things were never displayed properly (and there was still a catch-all bag). I wanted to do something to the back of the bookcase, and with all the extra paint I had from my stripes, I decided to use some of those bottles to paint the back! I cleared everything off and got started. It didn’t take long before I had two coats on the back of the shelves. 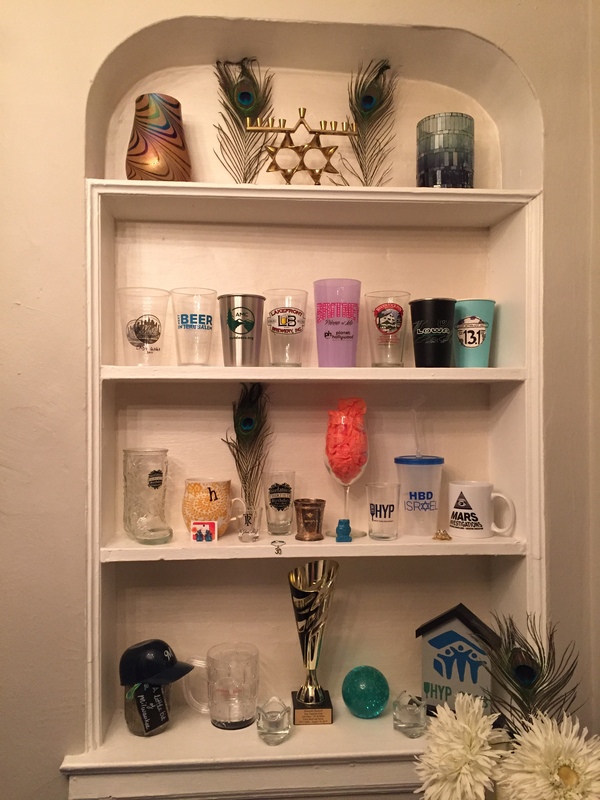 Once it was dry, I rearranged the glassware that I had put on the shelves originally. I grabbed some other items I had around my apartment to fill out the rest. It’s a very subtle difference, but I like it! The bookcase has a glow to it, and it’s not as stark white but still different enough that it’s special. Not to mention, it’s finally nice to look at and organized! 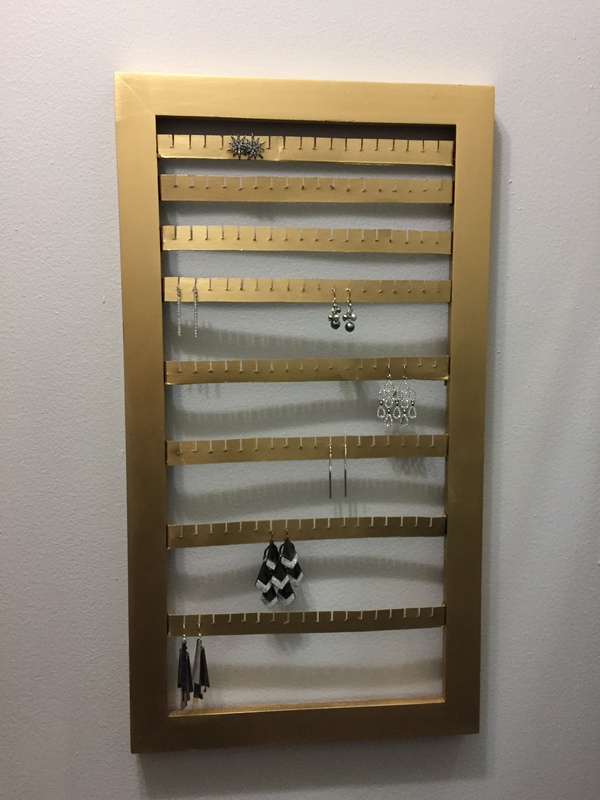 There was a brief moment of good weather on Saturday morning, and I was able to sneek in some spray painting for my earring holder! No, the Cheerio logo wasn’t meant to be part of the final design. 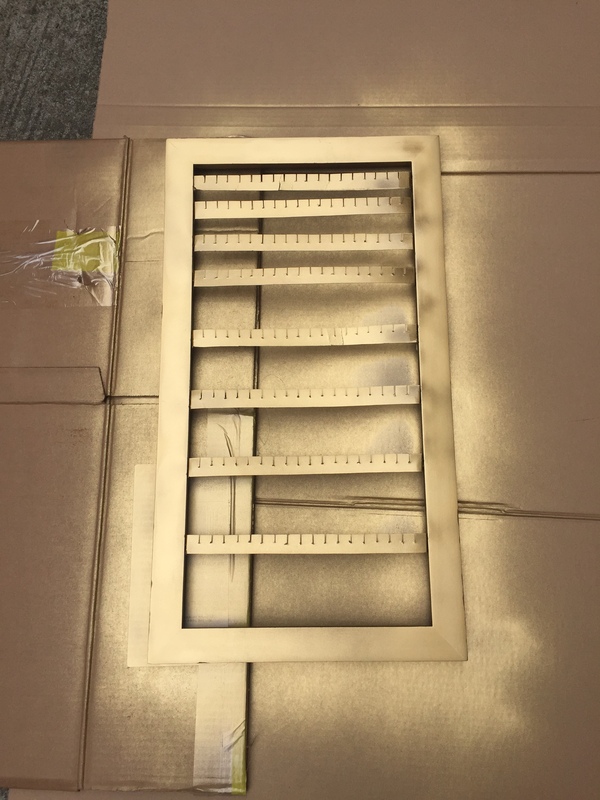 I knew that I’d eventually spray paint something, so I had saved a large piece of cardboard from my mirror and a box from a package that had arrived recently. My building has a courtyard area out back, which seemed like the perfect spot to do some sneaky spray painting. 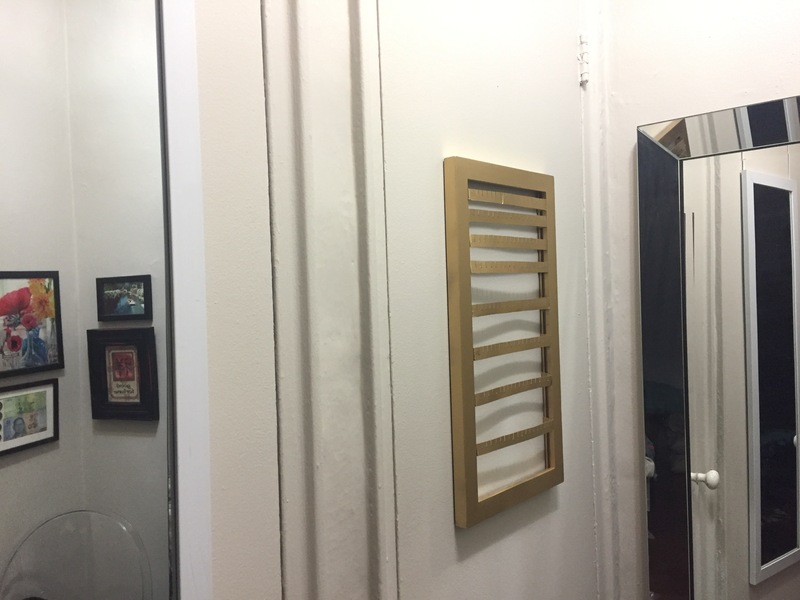 I lightly sanded the frame, and I used a can of gold spray paint I had bought when I considered spraying the laundry hamper (which I still might do, but not today). I finished just in time too! While The Weather Channel said it wouldn’t start raining until the afternoon, some drops starting falling right as I was finishing up! I quickly grabbed everything and ran inside, where I left the frame to fully dry on the floor of my apartment. 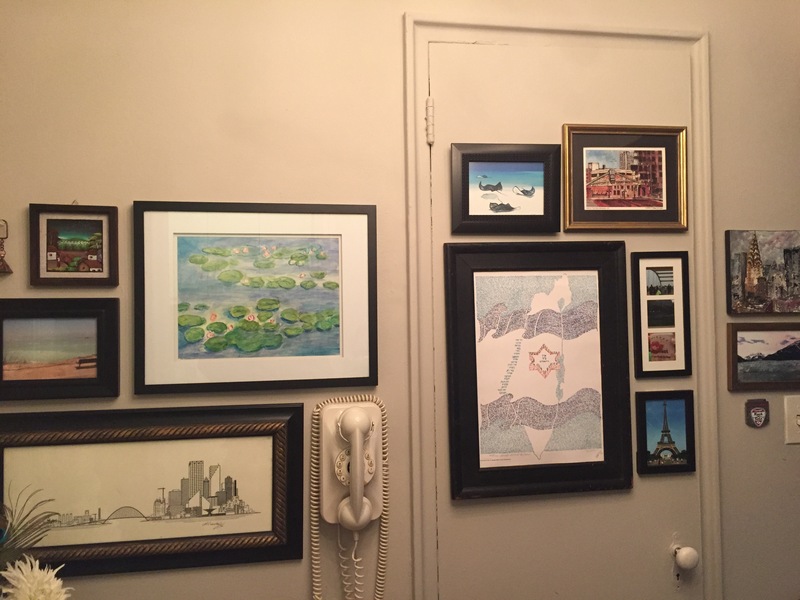 To hang it, I used some 3M Command Strips. 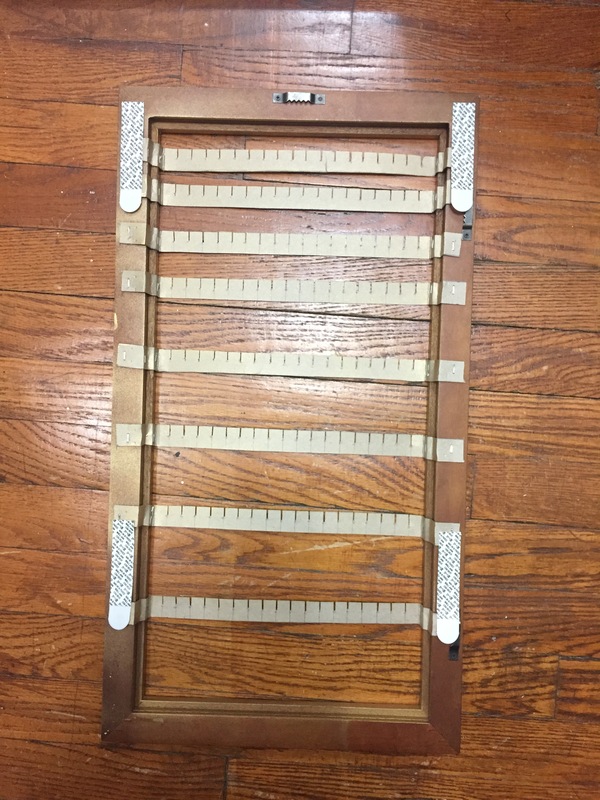 After holding it up to the closet door, I realized that the frame’s original hangers stuck out too far. A few quick turns of a screw driver, and they were gone. Then I balanced the level, and pushed to secure it to the door! I’m a little unsure if it’s on there well enough, though. 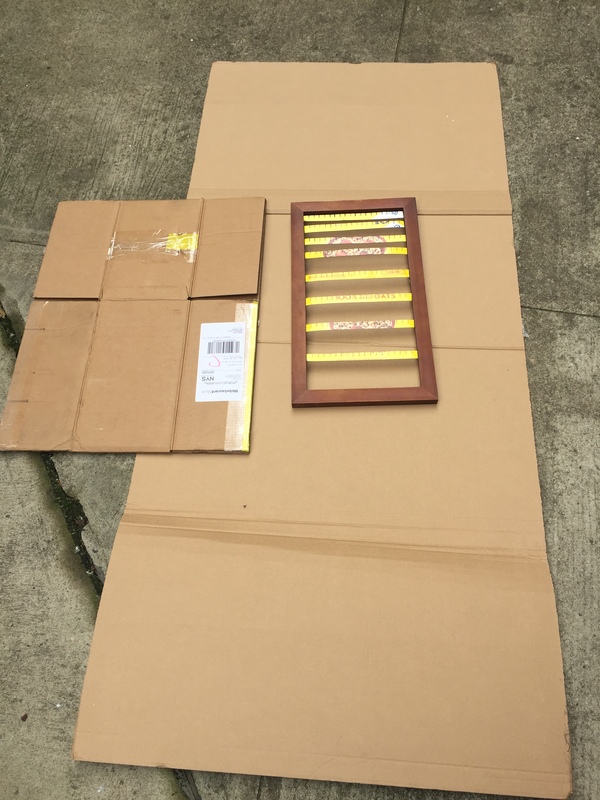 The box strips across the back prevent the 3M strips from making full contact with the door, and things probably aren’t smooth and plumb to begin with. But that didn’t stop me from hanging a few earrings on it! I think I’ll fill the rest of the door up with some necklaces and other jewelry! PS. 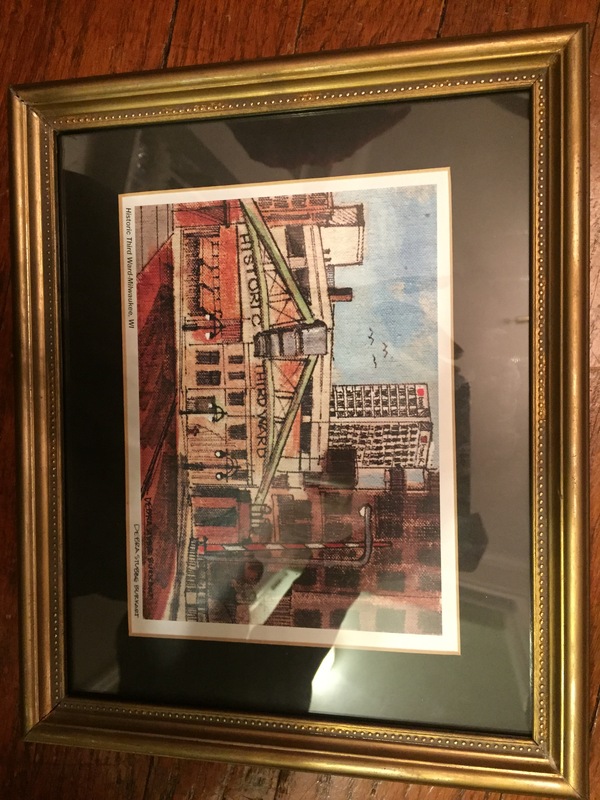 I updated my post from last week–I had forgotten that I bought an art print when I was in Cayman! I ended up replacing the Cayman sunset picture with the print.